Mutants and superheroes have faced examination, illegality, and hiding in plain sight. "X Men" (2000) introduced the mutant collection of Professor Xavier to the big screen --- as his "school" for kids with special talents existed in a jurisdiction where mutants are forbidden. Before the worries of super powered beings hit mainstream ("Death of Superman"), a 2003 animated film portrayed an exiled superhero family, The Incredibles. Pixar created Bob and Helen Parr ( Mr. Incredible and Elasticgirl voiced by Craig T. Nelson and Holly Hunter) who reappear for the sequel , so too their three kids, 14-year-old Violet (Sarah Vowell), 10-year-old Dash (Huck Milner) and superbaby Jack-Jack. Lucius Best/Frozone (Samuel L. Jackson) who recalls the Silver Surfer is back too. Opening with Underminer (a huge boring screw) emptying Municiberg bank vaults, the working together battle with the family of "supers" leaves a mess of infrastructure to clean and rebuild. That sets off another clash with the establishment accented by the economics of reconstruction and insurance payments following a mid-city standoff. Relegated back to a slummy witness protection motel, the budding youth scream "we want to fight bad guys," at a time when an eccentric telecommunications billionaire and his sister brother and sister Winston (Bob Odenkirk) and Evelyn (Catherine Keener) offer an opportunity to overturn the unjust law by altering public opinion. Their plan initially puts Elasticgirl in the spotlight relegating Mr. Incredible to a heroic powered Mr. Mom. Actually, that's a good call for writer/director Brad Bird, especially considering her ""leave the saving of the world to men? I don't think so"statement from the original AND the surge of female hero popularity that surged after 2017's "Wonder Woman." Zesty, whip-smart dialogue mixed with escapes and real world family dynamics override the precise, detailed animation, which during two major "saves," blend excellently for backgrounds. 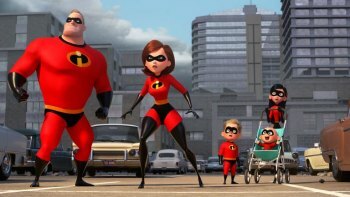 Special effects in live action hero flicks utilize animation and computer generated scenery so about 50% of "Incredibles 2" could stand along human, not drawn, characters. As the villain's plot materializes , the illusion topples, yet it avoids (by their chinny, chin, chin) the fate of losing adult flavor for "cartoony" styles. Bird's strong concentration on daily family struggles (making the school bus, stood up for a date, baby's first display of powers) have dimensional holes and frozen terrain throughout sneakingly injecting a similar symbolism to that of "Frozen" --- being yourself even when burdened with super powers. My wildest observation , which must be tempered to avoid spoiler classification, is for better or worse , parody shifts by the third arc to typical heroic genre mainstays. No longer an anomaly the time for punches about capes and secret identities have past. I think Bird's cultivating daggers at evolving family traditions for ordinary misters and still stretched past limits Elastic Women.